Jamaican women sprinters set a new record placing one, two, two in the 100 meters at the Olympics in Beijing, on the birthday of the island’s first national hero, Marcus Garvey. 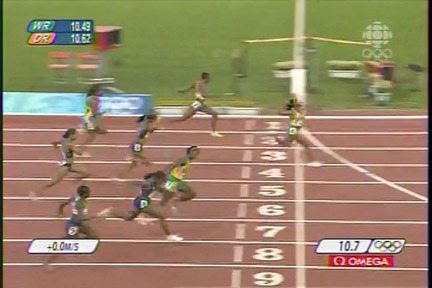 Shelly-Ann Fraser took the gold, leading home an unprecedented clean sweep for Jamaica. Fraser finished in a time of 10.78 seconds, with her compatriots Sherone Simpson and Kerron Stewart sharing the silver medal after a dead heat. “I’m so excited. I never dreamed this could happen to me,” said Fraser. We take the libery of sharing the race as Canadian Broadcasting Corporation saw it.